She had no friends with her on that day, only enemies. Even the man she thought loved her was not even willing to stand with her in the presence of these religious people who wanted nothing more than to see her die. Dragged out of bed and into the presence of Jesus and those listening to His message, she was no doubt barely clothed, disheveled, and shamed. The story of the woman brought to Jesus when found committing adultery is one I dearly love, and maybe not for the reasons you may think. It’s a story of two sides – Jesus, and religion. And it’s a story of condemnation being met with compassion. Religion referred to Jesus not as Master, not as Lord, but solely as “Teacher”. This is still how we can seperate those that are followers from those that are only willing to learn religion. It all about who YOU say Jesus is to you, not in your words, but in your deeds. It’s not lip service God wants, but your heart. If your heart doesn’t follow Him, neither will your actions and neither do you. Religion went on to say that she was “caught in adultery, in the very act” and that under the law of Moses, she should be stoned. Religion didn’t care who she was, only wanting to point to her sin, and seek her punishment. Religion showed no mercy, no compassion, but wanted her death. Religion also wanted to see Jesus fail by breaking the laws of Moses. Aren’t there religious people still among us today that want to see Jesus fail? They love and even seek to find the compassion of Christ and His mercy fall short, and for people to “get what’s coming to them”. They use the word “Karma” without knowing its idolatrous roots. But Jesus, the Son of God, sought to redeem her from her sin. But not only her, but those that brought her to Him. 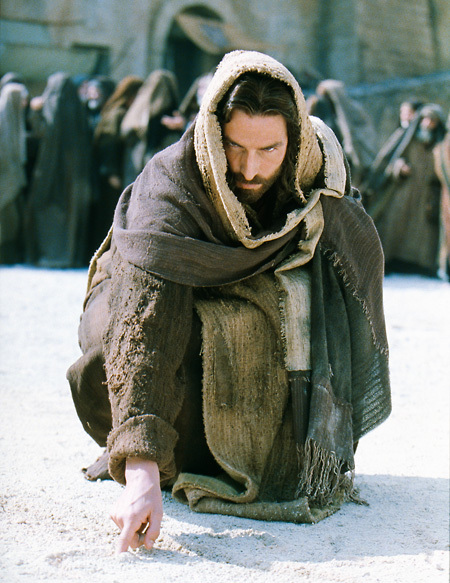 Many wonder what it was that Jesus wrote in the sand that day, sitting in silence. I’ve often wondered if He scribbled down a passage from one of the Psalms about God’s mercy. Or maybe He wrote down the sins of each man standing there in front of Him judging this woman. And maybe He just took the time to scribble nothing at all while listening intently to the voice of His Father God, and receiving instruction on how to handle this situation. Speaking only to the men who brought her to Him, He says “He who is without sin among you, let him throw a stone at her first.”, and He went back to scribbling in the sand. Jesus could have pointed out to them each and every one their very sins, but He remained quiet. Their own consciences convicted them and one by one, they dropped their stones and left. Jesus looked up from His scribbling at the woman who was left alone, and still standing there in front of Him. He said “Woman, where are those accusers of yours? Has no one condemned you?” and she answered “No one, Lord”. “Lord”, she said. She knew Jesus even more than those who claimed to be holy and religious. She understood who He was. Maybe this wasn’t her first time in seeing Jesus. She could have been in the group that had been following Him. But maybe it was just the fact that He showed her the love of God – unconditional love. Jesus said, “Neither do I condemn you, go and sin no more.” He was the only one present without sin that could cast the first stone, and He never even picked one up. It never crossed His mind to stone her. The law of Jesus is not an eye for an eye, or we’d all be blind! His way is compassion, and forgiveness. So then how should we respond to one brought before us living with sin? Should we ignore them when they come to church? Should we look down our noses at them as if they were dirty? Should we discuss their sins behind their backs? Should we exclude them from our churches and make them outcasts of society? I guess that depends on whether you’re religious, or whether you seek to be a true Christian, and follow Christ.